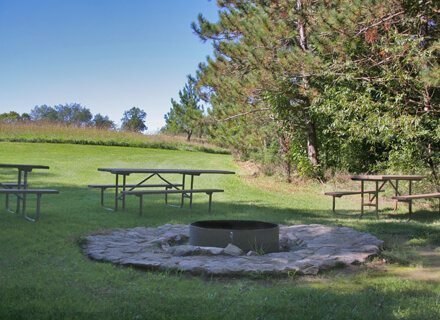 The Red Pines Campfire is a popular site for summer campouts and gatherings and is used annually with scout troops, outdoor clubs, and small groups. The site is ideal for a large group gathering around the campfire and perfect for roasting snacks. Special permission may be given for group overnights. From the gatehouse, take the first right. When you reach the athletic field, go right at the fork and continue for a quarter mile until you see the sign for the Red Pines Campfire on your left.